Who's Jacking Up Housing Prices in West Oakland? Answer: Large-scale investors. They're snapping up foreclosed houses in the city's flatlands, and then selling or renting them at prices that many residents can't afford. 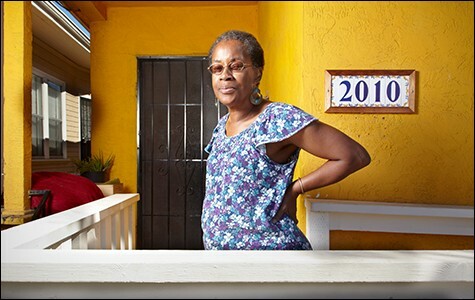 Activist JoAnne Stamps said tenants of foreclosed homes have been forced out by high rents. 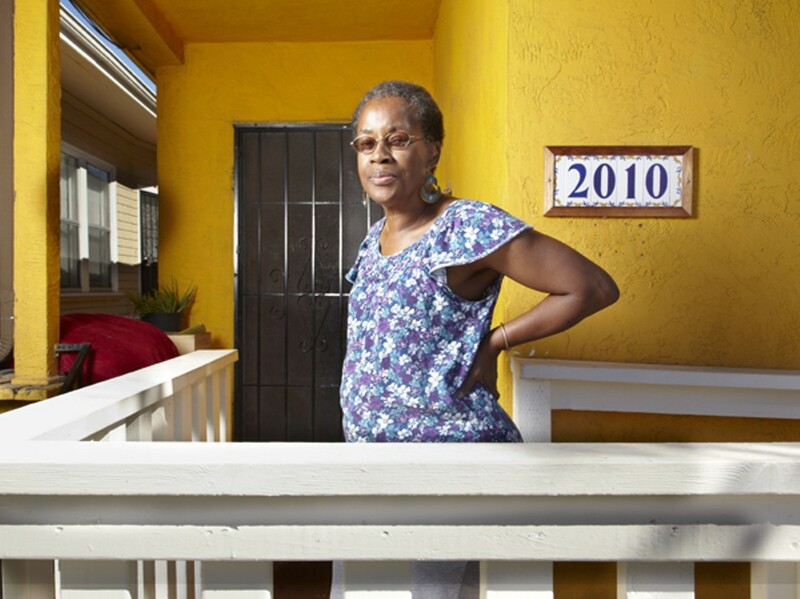 As the tsunami of foreclosures in Oakland finally subsided over the past year, residents of the city's flatlands neighborhoods looked around at the new landscape and saw less room for themselves and people like them. Many of their neighbors were gone, of course. And many of the foreclosed homes were snapped up — not by new homeowners, but by large-scale investors, including national and global corporations. Some of these investors have stuck to the traditional fix-and-flip business model, but others are assembling large numbers of houses to rent. Colin Weil, managing director and co-founder of Oakland-based Waypoint Homes, which owns more than 4,000 houses across the country, has told reporters that he believes the single-family-house rental business will become a $10 billion industry nationwide. Whether flipping or renting, the new owners have put a higher — sometimes much higher — price tag on living in traditionally low-cost West and East Oakland, home to large black and Latino populations. And the investors have found eager renters and buyers streaming across the bay as housing costs in San Francisco continue to soar. The result, said Steve King, a researcher for the nonprofit Urban Strategies Council, is "wholesale neighborhood change." The process is "transferring homes where people have lived a long time, raised families, been part of the community, to younger folks, mostly white," added Maurice Weeks, campaign coordinator for the Alliance of Californians for Community Empowerment (ACCE). But the city is "trying to do what we can to forestall the displacement [with new] strategies to keep people here," said Margaretta Lin, special projects director in the City of Oakland's Community and Economic Development Agency." Several nonprofits are partnering with the city and also launching their own programs with the goal of increasing the availability of affordable housing in Oakland. And ACCE has started a campaign to hold large-scale housing investors accountable to the community. But some residents see some benefits to the investors' interest in their neighborhoods. "The big advantage is that a lot of the blight is now being attended to," said Patty Flores, a real estate agent who works in West and East Oakland. "But it's kind of pushing the poor or average buyer out of the loop." Investors with deep pockets can not only outbid would-be homeowners, but can pay cash, making their offers much more desirable than bids from people who need a mortgage. "It's very frustrating," said Flores. "A person with a conventional loan is almost bullied out of the market by investors paying cash, more often in the low end of the market." When investors fix up a house and put it back on the market, Flores added, the price increase "can be pretty dramatic. Something you could have bought for 150 is now rehabbed and selling for 350." But the repairs don't always justify the higher price tag. There's widespread suspicion among people familiar with the housing market that "rehabilitation" can mean little more than slapping on a coat of paint. "Unfortunately, some companies do the work without benefit of permits," Flores said. "We don't know what's behind the walls." Sele Nadel-Hayes, daughter of former Oakland Councilwoman Nancy Nadel, said it took her a long time to find a house she could afford in West Oakland, where she grew up. "I was finding a lot of houses recently purchased by flippers," she said. "They looked like they were in a magazine, but they were outside my price range." Renters also face rising costs. Martha and Eddie Daniels, both living with disabilities and supporting two teenage grandchildren, had to move when the house they rented in West Oakland was foreclosed several years ago. Now they are being evicted because their landlord sold the house they currently live in. Their rent is now $1,450, said Martha Daniels, and her paycheck — their only income — can't cover the new rents in the neighborhood, which range from $1,700 to $2,000. "Some people who were tenants before their houses were foreclosed had to move out because they upped the rent," said West Oakland ACCE activist JoAnne Stamps. According to a market analysis from Red Oak Realty Investors, purchase prices in Oakland rose 64 percent from the second quarter of 2012 to the second quarter of 2013. And when one investor buys a significant amount of property in a neighborhood, it has an impact on the whole area. In addition, said researcher King, many of the corporations currently renting out single-family houses are planning to sell them in five to seven years, after they increase in value. "Then we'll have a whole other wave of destabilization," he added. And foreclosures, while down dramatically from their peak, are continuing. Lin said 1,500 Oakland homeowners are currently in some stage of the foreclosure process. The Red Oak Realty analysis showed that one-fifth of the home sales in Oakland were of "distressed" properties — foreclosed or short sales — the kind most attractive to investors looking for a bargain. And in sales under $300,000, 45 percent of the properties were "distressed." That means the lowest-income buyers are the most likely to lose out to investors. West Oakland is the epicenter of all these changes. Margaret Gordon, a longtime West Oakland community leader, said in her immediate neighborhood, every home from which an African-American family has moved out is now occupied by non-African Americans. "The new people are mostly white and Asian, groups of young people," she said. "Only a few of the people moving in have families." Another longtime West Oakland resident, Chantel Burrell, summed up the comments of many of her neighbors: "This is the new San Francisco."